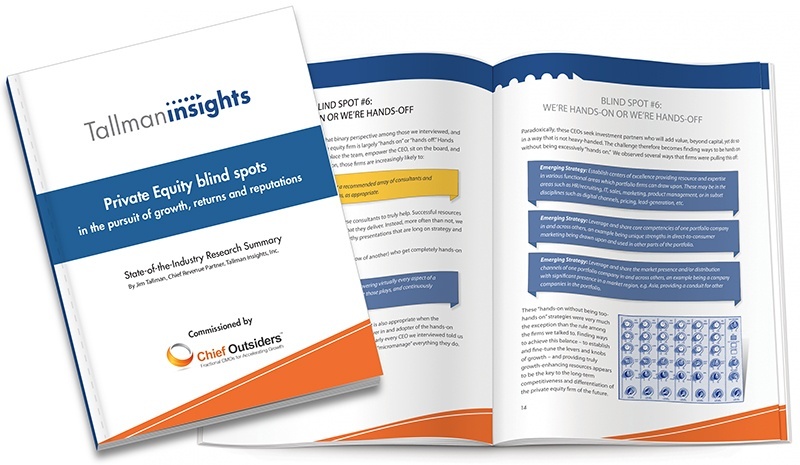 AUSTIN, TX – August 7, 2018 – An insightful study was released today that identifies seven blind spots evident among private equity firms seeking portfolio company growth. Conducted by customer research and go-to-market integration firm, Tallman Insights, the report identifies the commonly used “Table-Stakes Strategies” that are growing less and less viable in today’s growth-critical environment. Then, it recommends thirteen “Emerging Strategies” for PE firms to consider to differentiate themselves, get more competitive and add more value. The findings were based on extensive interviews with thirty mid-market and lower mid-market PE firm partners, and CEOs of portfolio companies. “I was surprised by our discussions with PE stakeholders in a couple of ways,” said Jim Tallman, who led the study. “First, it was interesting to see how prevalent many of these perceptions – potential blind spots – seem to be. I was also struck by how similar most of the firms were.” His 19-page report is quite critical of the current state of competitiveness in driving growth. “Only a handful seemed to be pursuing the emerging tactics for adding value and manufacturing growth versus more traditional strategies of selecting companies carefully and waiting for the growth,” Tallman added.